AZtecLive is powered by Ultim Max, the next generation Silicon Drift Detectors (SDD) combining the largest sensor sizes with Extreme electronics to deliver unparalleled speed and sensitivity. Video rate electron and chemical imaging enables real-time navigation by chemistry for the first time. Automatically record where you have been and what elements have been detected so you never lose a feature of interest. See both the position and concentration of elements to quickly find ‘hot spots’. The combination of Extreme electronics with the X4 pulse processor allows Ultim Max to map samples at count rates of 1,500,000 cps and accurately quantify composition at 400,000 cps. Size really does matter. Use the large Ultim Max sensor areas of up to 170 mm2 to deliver unparalleled count rate under the most demanding analytical conditions. AZtecLive enables the quick and comprehensive investigation of a sample with real-time chemical feedback via the AZtecLive interface. No need to move back and forth between the microscope and the EDS software. 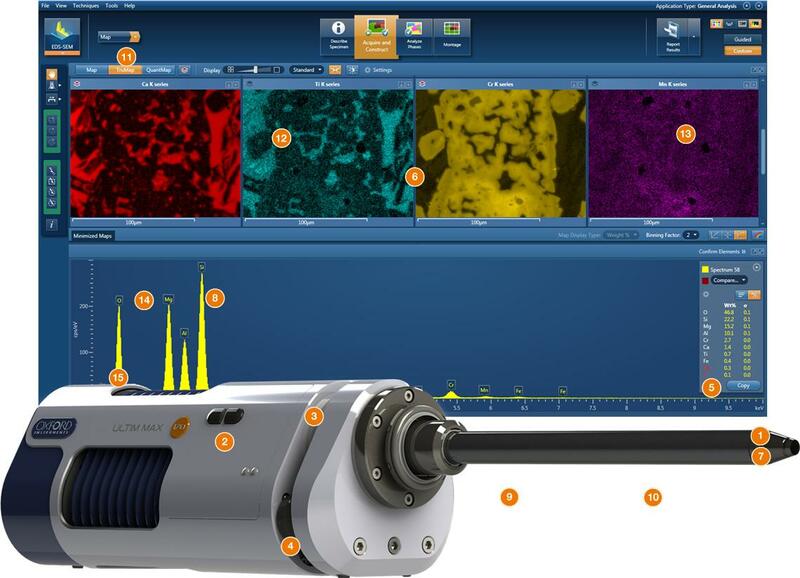 Just navigate around your sample while viewing Live TV rate electron image and X-Ray maps until you find a feature of interest, then stop and AZtecLive will automatically switch to integration mode to collect high quality image and X-ray maps allowing you to see the detail in your sample. 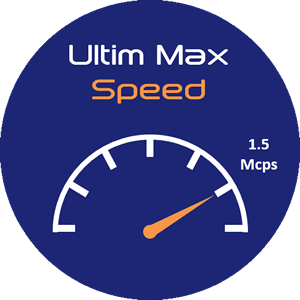 The large SDD sensors of Ultim Max allows up to 17x more data to be collected in the same time with no loss of accuracy. 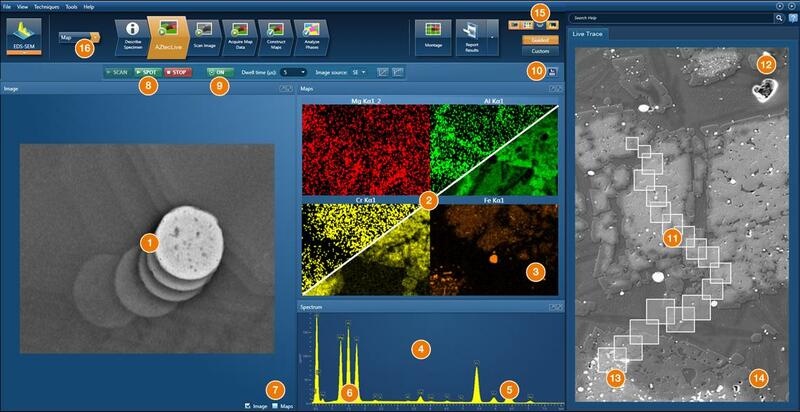 Whether you want to map larger areas, have better statistics in each data point, collect data much faster, or investigate the smallest nano-structures, Ultim Max is the ultimate solution for X-ray analysis in the SEM. AZtecLive’s unique approach to EDS analysis is based around the principal that the user is presented with all the data they need to investigate their sample without having to acquire it manually. Everything is ‘Live’ and continually refreshed. This begins with the electron image, which is streamed live into the AZtecLive interface. Now there is no need to go back and forth between the microscope and EDS software, all you have to do is choose between SE or BSE image. Like the electron image, with AZtecLive the X-ray maps are ‘Live’ and continuously updated. There is no need to choose when and where to acquire X-Ray maps and no need to wait for maps to acquire before deciding whether to investigate more or move on to another area. With AZtecLive you can see chemical information all the time, even as you move around your sample. Sample investigations can now be done in a fraction of the time and with increased confidence and certainty that you will find what you are looking for and have a representative view of your sample. AZtecLive automatically transitions between responsive ‘Dynamic’ mode when navigating around your sample and high quality ‘Integration’ mode when stationary. Dynamic Mode is made possible by the high count-rates delivered by the new Ultim Max large area Silicon Drift Detectors. You can view responsive and informative TV mode electron image and X-Ray maps while moving around your sample. Integration Mode recognises that when you find a feature of interest and stop moving the stage, what you really want to do is discover more about the feature. So when the stage has stopped moving, AZtecLive automatically switches to Integration mode to give you higher quality data to reveal the finer detail. When you decide to move to another area, AZtecLive automatically switches back to the more responsive Dynamic mode. AZtecLive has a new unique pile-up algorithm to ensure accurate Element ID when collecting data from multiple phases at high count rate. Pulse pile-up is a common artefact when using high count rates, and is most obviously seen in the form of sum peaks where two X-rays of an element are identified by the system as a single X-ray with twice the energy. 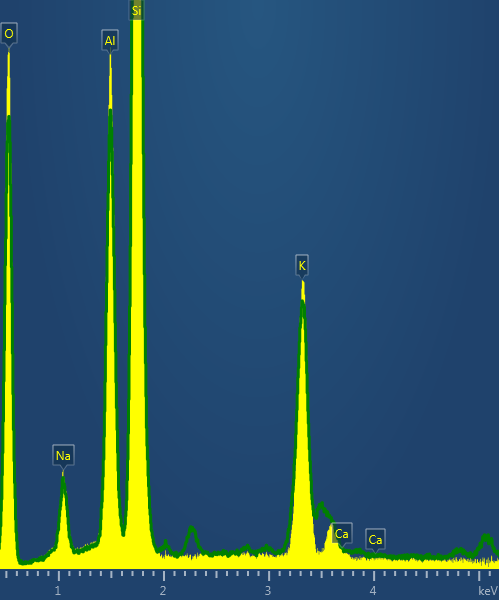 If not removed these sum peaks can be mis-identified by the software or user as real elements. Common examples are Al + Al = Ar and Si + Ca = Cr. Correcting for pile-up becomes increasingly challenging as count rate increases, and until now was only possible on a spectrum from a single composition. The new algorithm in AZtec Live also works for data from an X-ray map which will come from more than one phase. It uses a clustering algorithm to divide the data into regions of the same composition, before applying a pile-up correction on each one. After correction the data is recombined so automatic element ID can be carried out and the elements present in the sample correctly identified. 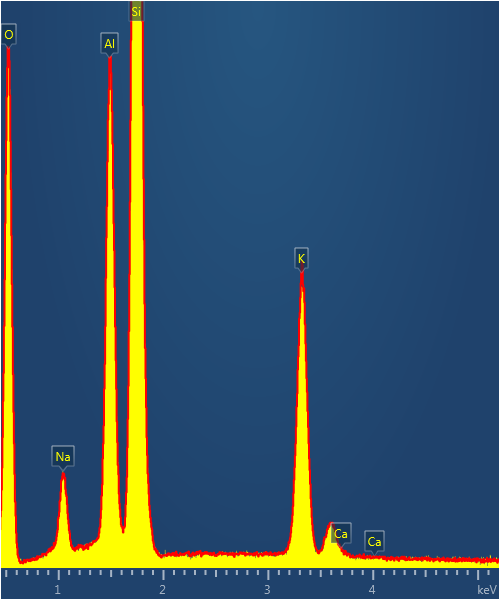 Spectra collected from a complex multi-phase sample during AZtecLive mapping at high count rate. The first spectrum includes false element ID due to pulse pile-up, e.g. Cr which is Si+Ca. The second spectrum has been corrected by AZtecLive’s unique phase clustering-based algorithm which removes these artefacts and the false element identifications. The richness of information from electron images, X-ray Maps and spectra can sometimes be overwhelming. 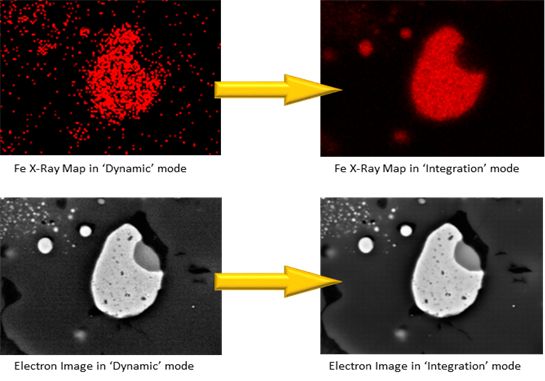 Having the ability to overlay selected X-ray maps on the electron image to create a Layered image, means that you can see both morphology and chemical information in a single image. This is really useful when looking for a particular phase in a sample. During general operation the spectrum shown in the AZtecLive interface is a sum spectrum from the full field of view. This gives a general overview of the elements detected. When you find a feature of interest and more detail is required, simply switch to spot mode and click on the image (or one of the X-Ray maps) to see the spectrum from the feature. 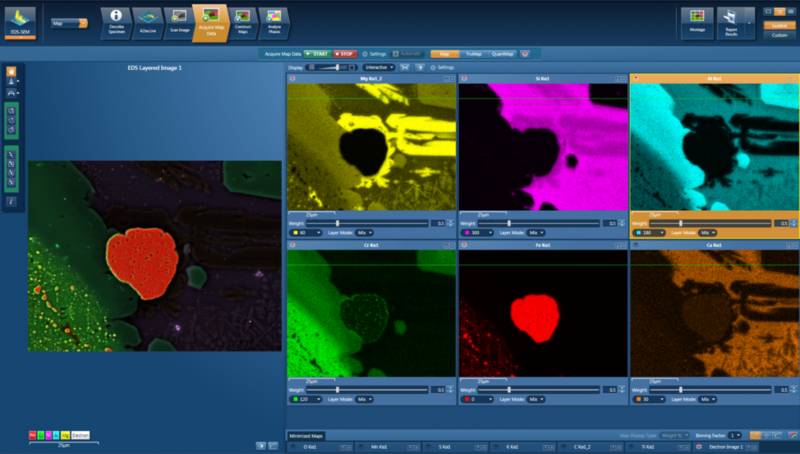 The Reduced Raster functionality lets you fine tune the electron image in AZtecLive rather than having to go back to the microscope interface. Reducing the scanning area and freezing the X-Ray maps means that the image is responsive enough to adjust Brightness, contrast, magnification, focus and even stigmation. At any time during your sample investigation you can save all the data you can see with a single click. A site of interest will be created in the data tree with the Electron image, X-ray maps, Spectrum. Have you ever been investigating a sample and wondered whether you have analysed a representative area or whether you have looked at a particular feature already? ‘Live Trace’ automatically records where you‘ve been on your sample and what elements have been detected. So you can easily see whether you have covered a representative area or indeed whether you have visited the same area before. The size of each area on the live trace shows you the area imaged at each location. If after completing a quick survey of your sample you want to know whether a specific element was detected or whether there were any ‘hotspots’ of high concentrations. Then ‘Live Trace’ allows you to simply switch to an element only view, which will show the locations where the element was detected and also the relative concentrations detected at each location. 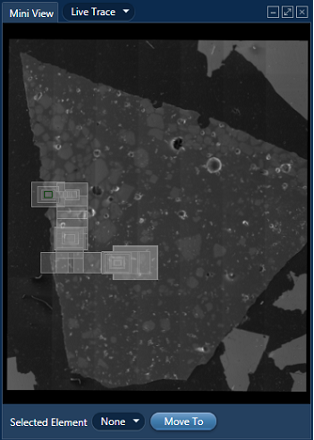 Live Trace view of Aluminium locations recorded during an investigation of a slag sample. The area highlighted by the user has a high Aluminium concentration. If after inspecting the Live Trace you see a region that was exhibited a high concentration of a particular element or showed the presence of an element you didn’t expect, then all you have to do is click on the area and tell AZtecLive to relocate to the area so you can perform a more detailed analysis. If you have a previously acquired low magnification image or Large Area Map of your sample, then it is a simple task to register it with AZtecLive and it will automatically be placed in the background of the Live Trace. This allows you to achieve an overall view of where you’ve been on your sample and what elements have been detected. Custom Interface layout enables you to modify the AZtecLive step to suit your application or personal preferences. Simply select which quadrants you want to show or hide from the electron image, X-Ray Maps, periodic table and sum spectrum. 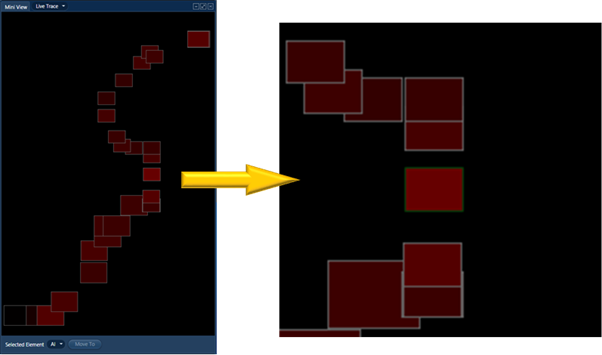 You can also undock a quadrant and either make it full screen or even move it to another monitor. If at any time during your ‘live’ inspection of a sample you want to use all the power tools of AZtec to perform a more detailed analysis, then simply switch navigators or steps and you can carry on your analysis seamlessly. Ultim Max is available with multiple sensor area options. Larger sensor areas deliver higher sensitivity because they collect more of the X-rays emitted from a sample. Using the same conditions, Ultim Max 170 mm2 detectors will collect up to 17 times more data than a conventional 10 mm2 SDD detector. Therefore, 17 times more of a sample can be mapped in the same time. X-ray maps collected with different sensor areas using the same microscope conditions. Count rates increase from 88,000cps for 10 mm2 to 1,500,000cps for 170 mm2. Therefore, for the same data quality, map resolution increases from 128x128 pixels for 10 mm2 to 512x512 pixels for 170 mm2 sensor areas, revealing much more of the sample in the same time. Ultim Max incorporates Extreme Electronics. These electronics were developed to detect Lithium by EDS, which was achieved in 2012 for the first time (Burgess et al. 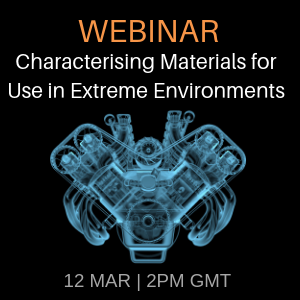 2013) and are being used to analyse Li-battery materials with X-Max Extreme and new Ultim Extreme windowless detectors. Extreme Electronics provide the lowest noise signal detection and processing available for SDD. They ensure excellent energy resolution and spectrum quality is achieved at the high count rates that are easily achieved by large area Ultim Max detectors. 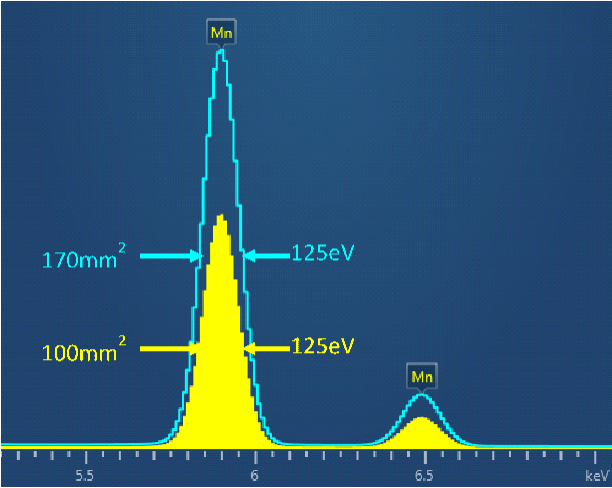 With a 100 mm2 detector, 130,000cps can be generated with around 1nA at 20kV, yet the resolution achieved is typically less than 125eV at MnKα. Spectrum collected at <1nA, 20kV from FeS2 using an Ultim Max 100. Count rate was 130,000cps, resolution measured at MnKα was 124.2 eV. Spectrum collected from LiAl Oxide in lithium battery solid electrolyte using Ultim Extreme. This corresponds to the orange area in the layered X-ray map where LiK is yellow and AlL red. 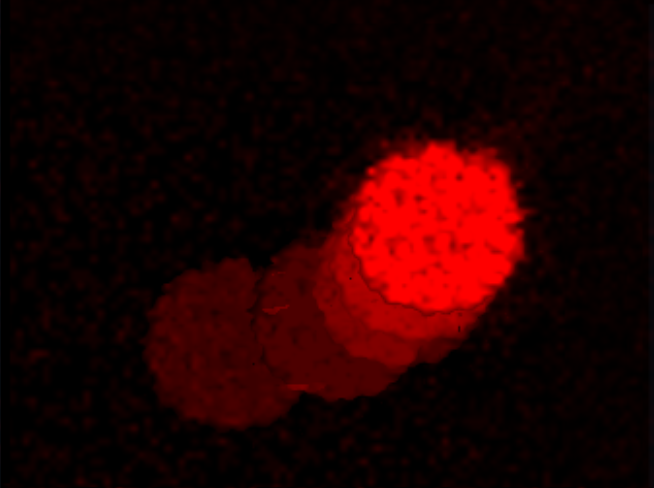 All Ultim Max detectors use a bellows interface to the microscope. This guarantees vacuum integrity is maintained during detector insertion and retraction. All Ultim Max detectors include an integrated motorised slide. This means the detector can be easily and rapidly inserted and retracted using software control from the AZtecLive software, or using the buttons on the detector housing. Only the combination of Ultim Max detectors and AZtec Live software can deliver the same accurate standardless quantitative analysis results at over 400,000cps as those achieved at low count rate. Ultim Max sensors and Extreme electronics provide the stability and fidelity of signal required for accurate processing and production of a spectrum with count rate independent shape and relative peak intensity. FLS – Robust algorithm for removing the X-ray background from the spectrum and fitting peak profiles of the identified elements to calculate peak areas that does not require any user set up. QCAL – New and unique approach to determining the precise position, resolution and shape of all element peak profiles to bring a new level of accuracy to both the calculation of peak area and the intensity relative to that of a pure element (“k-ratio”). Spectrum collected at over 400,000cps with Ultim Max 100 from an Orthoclase standard sample. The original spectrum has been corrected using pulse pile-up correction in AZtecLive to produce the spectrum in yellow. In addition to the removal of sum peaks, the X-ray events have been replaced at their correct energies, correcting the intensity of the real characteristic X-ray peaks. 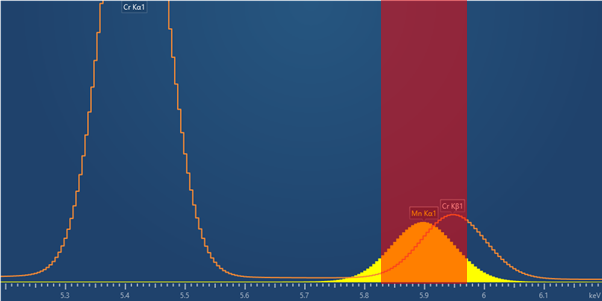 Comparison of spectra collected at over 400,000cps (yellow) and 4,000cps (red) from an Orthoclase Standard sample. Once automatic pulse pile-up correction is applied, no difference in peak position, shape or intensity can be seen between the two spectra. Composition of an Orthoclase standard calculated from spectra collected at 400,000cps and 4,000cps. Ultim Max maintains excellent spectral resolution and signal stability at count rates over 1,000,00cps. The new X4 pulse processor has been designed to work with Ultim Max to process signals at this very high rate to deliver ultra-fast mapping for AZtecLive. 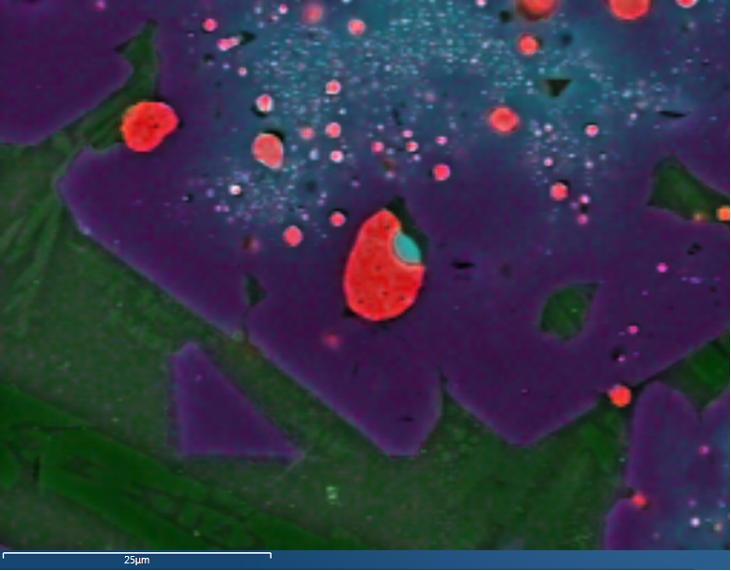 Sub-1 second mapping is used in AZtecLive for real-time chemical images aiding sample navigation and feature confirmation. 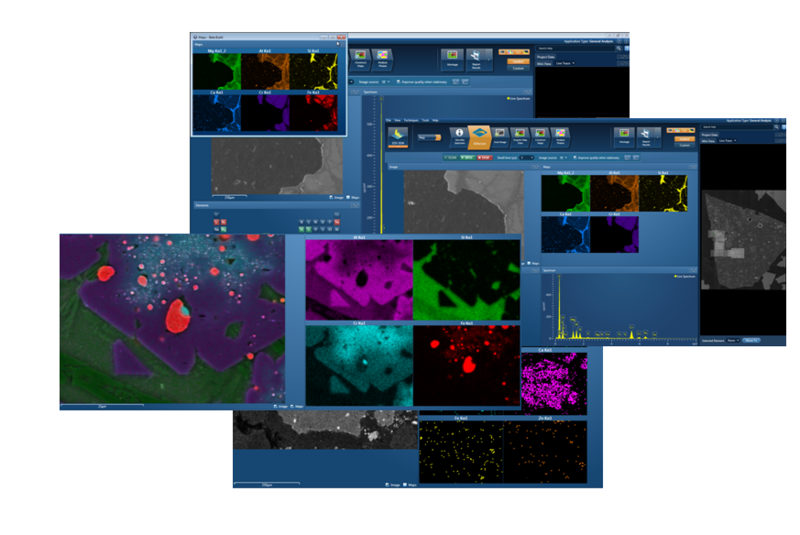 At 1,500,000cps, an X-ray map collected in as little as 5 seconds provides a detailed picture of the elemental make-up of a region of interest, with sufficient data for automatic phase analysis. Maximising sensitivity requires collecting as many X-rays as possible. The number of X-rays that a detector can collect is determined by its solid angle, which is proportional to sensor area and the inverse of the square of the distance between sensor and sample. 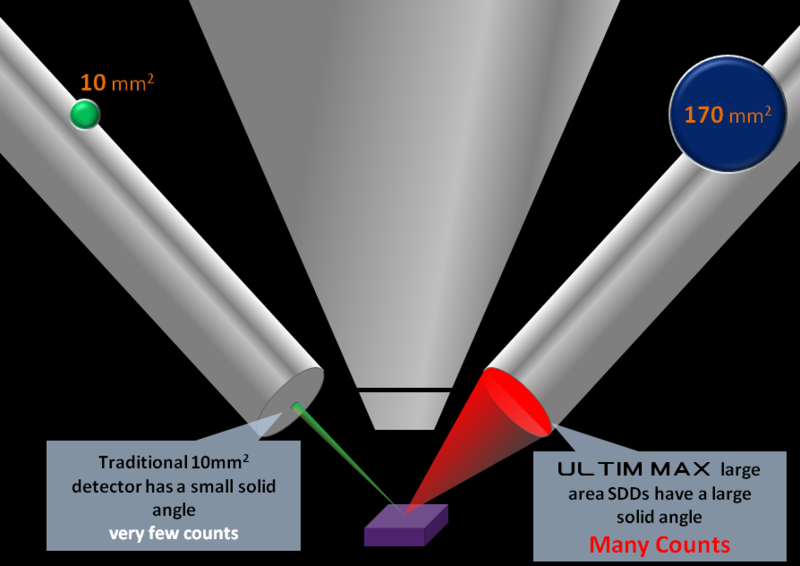 Ultim Max uses new innovative designs to place the largest sensors as close as possible to the sample. This means solid angles of up to 2x greater than previous generation X-MaxN detectors are achieved. The larger the sensor area the more capable an EDS detector becomes. Schematic image of 10 mm2 and 170 mm2 detectors, showing that as sensor area increases the number of X-rays that a detector can collect increases. Ultim Max detectors have guaranteed spectrum resolution which is the same independent of sensor size. All standard spec. detectors are guaranteed to achieve 127eV or better at MnKa measured at 130,000cps on installation, and during user operation. Typical resolution achieved by both sensor sizes is better than 125eV. All sensors also have excellent low energy performance with guaranteed resolution at Carbon of 56eV or better, also measured at 130,000cps. No special operation modes are required to achieve this performance. 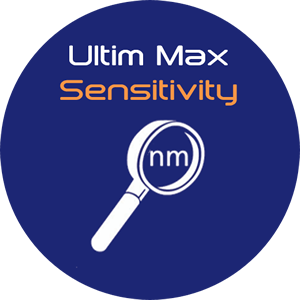 This means when choosing an Ultim Max detector you don’t need to accept any loss in detector performance or data quality when choosing a detector with a larger sensor. Choosing a detector with a larger sensor therefore will mean you gain the benefits of size while accepting no compromises. The majority of beam damage arises from three sources, ionization of the specimen by the electron beam, electron induced heating, and specimen charging. These damage mechanisms are primarily dependent on two factors, electron energy and beam current. To minimize specimen damage, a balance must be achieved between current and electron energy for each particular type of specimen. The large sensor sizes and high sensitivity of Ultim Max ensure that X-rays can be collected at the conditions required to minimise beam damage in a specimen. Sensor sizes of up to 170 mm2 allow the use of 17x less beam current than a conventional 10 mm2 detector or working at much lower electron energies. 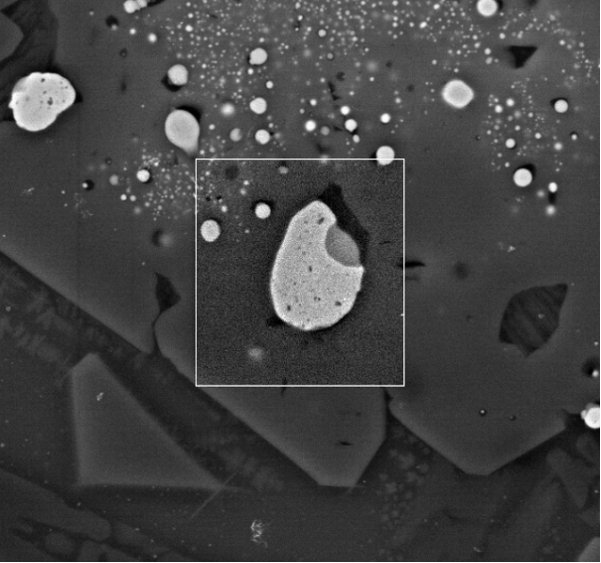 Electron images collected from a Li battery electrolyte specimen collected before and after the acquisition of a 10 minute EDS map. At 5kV the sample is significantly damaged. The high sensitivity of Ultim Max allows the use of electron energies of 2.5kV where damage is significantly reduced. Build up of contaminant during long exposure to an electron beam is always an issue when acquiring X-ray maps or high resolution images. 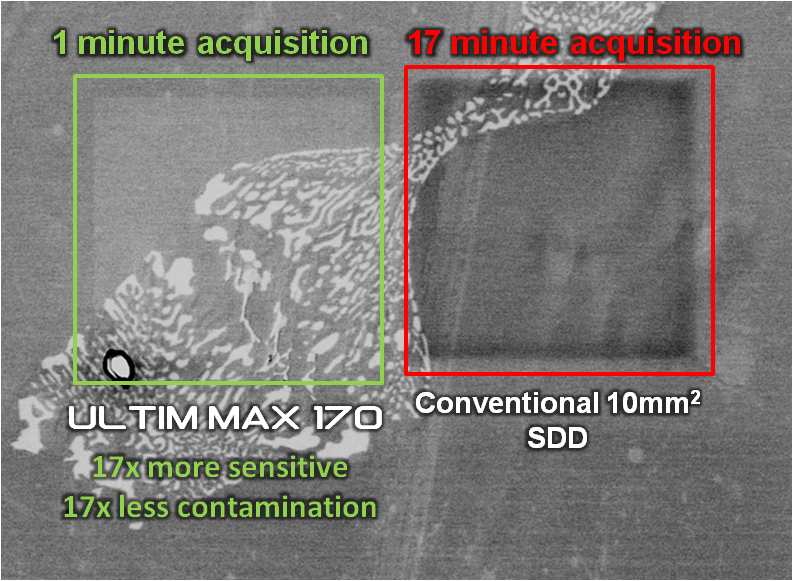 The large sensor sizes of Ultim Max allow the same data to be collected in as little as 1/17th of the time. This minimises exposure to the electron beam and therefore minimises the amount of contamination build up. This ensures that you analyse the specimen and not the contamination. 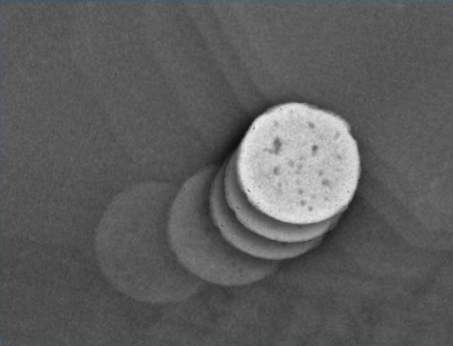 Electron image of a spinner bowl sample showing contamination build up after EDS map acquisitions of 1 minute and 17 minutes. TruMap gives the true picture of element variation in a sample. It accurately removes common artefacts responsible for errors in X-ray maps in real-time during data collection. As a result only real spatial variation of elements is shown, independent of variations in the X-ray spectrum. At every pixel in the map the spectrum is processed so the X-ray background is removed and the peaks of all elements are separated. This means that element signals are correctly separated when peaks overlap in the spectrum. In addition, apparent minor element variation which is often caused by different background intensity from different phases is also removed. Where peaks overlap, e.g. where Mn (MnKα) is present with Cr (CrKb), conventional X-ray mapping will show significant errors, because all X-ray counts in an energy window for each element are combined. Mn and Cr maps in this sample look identical, however this is due to the dominance of the Cr signal. 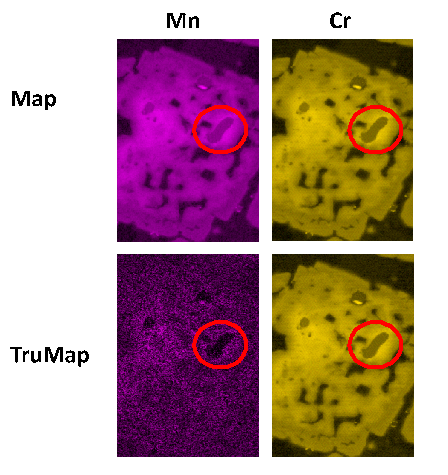 TruMap separates MnK from CrK to show the real underlying Mn variation without changing the real Cr variation. X-ray maps collected at 100 of thousands or millions of counts per seconds using SDD detectors, often shows an immense amount of fine low intensity detail. This detail is more often due to variation in the X-ray background intensity than real element variation. X-ray background intensity is related to the mean atomic number of a phase. The heavier the phase the more background X-rays it will emit. Therefore gold particles in an oxide matrix will appear to have higher element intensities where the particles are present than in the surrounding matrix. 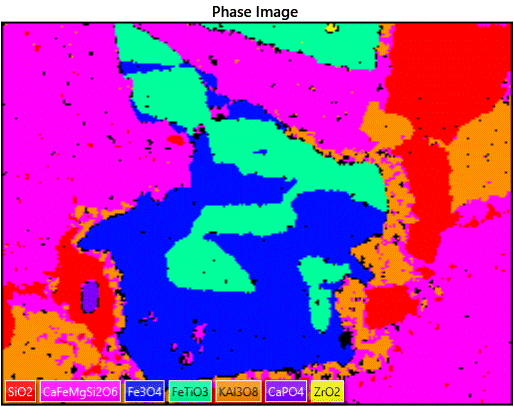 High count rate X-ray maps from this sample will show apparent variations for every element in the periodic table, due to the phases having significantly different mean atomic number. Therefore for accurate mapping of low intensity signals the background signal must be removed. TruMap uses the Tru-Q FLS technique, meaning the background is removed automatically, without the need to model the background for each phase. This allows the real variation of minor elements to be determined. X-ray spectra collected under the same conditions for Au, Fe, SiO2 and BN. 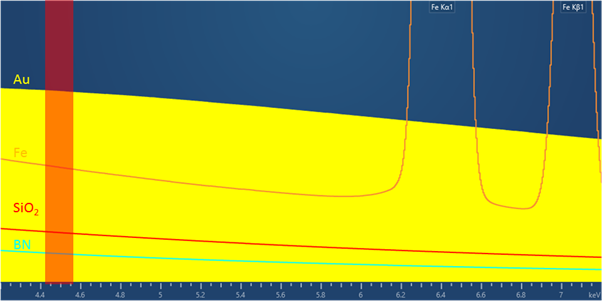 Intensities in the energy window used to calculate Ti maps (red) vary widely due to the different background intensities from the different materials. X-ray map of minor levels of Ti in a sample. 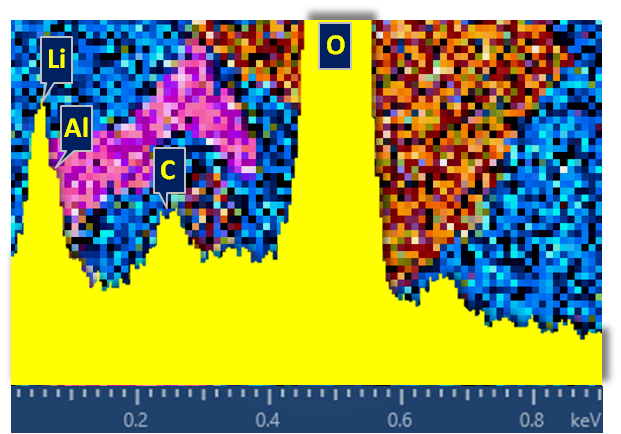 Despite no elements overlapping with Ti in this sample, TruMap shows there are significant errors in the traditional X-ray map, caused by the background intensity change between Cr/Fe particles and the surrounding oxide matrix. Combining Ultim Max and AZtecLive offers the unique capability to map minor element variations. Ultim Max is sensitive enough to rapidly provide enough counts to achieve sufficient precision to image changes on the 0.1wt% level. Variations due to peak overlaps and background intensity are automatically and accurately removed by TruMap. TruMaps for Mn and Ti in this sample reveal real variations in minor elements which have been confirmed by WDS. 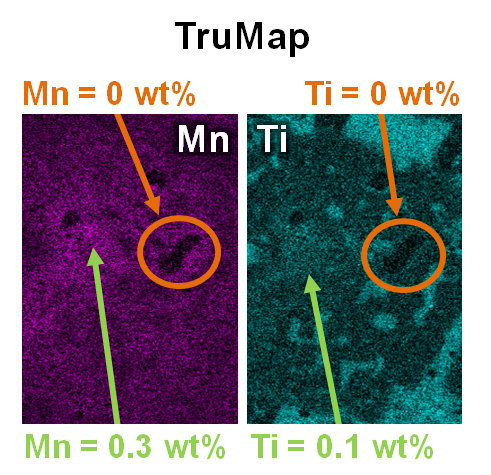 Variations in Mn between 0 and 0.3wt% and Ti between 0 and 0.1wt% are clearly visible. For light elements with X-ray energies less than 1keV, count rates are reduced by the presence of an X-ray window no matter what the material properties of that window. The Larger sensor sizes of Ultim Max ensure that more of the low energy X-rays generated in the sample are collected. Extreme electronics allow more of those low energy X-rays to be counted. This powerful combination maximises sensitivity for light elements. For ultimate light element sensitivity Ultim Extreme uses windowless operation, to increase light element sensitivity by up to 8x. To improve the spatial resolution of EDS the incident energy of the electron beam must be reduced. As electron landing energy is reduced the number of X-rays generated also decreases. To overcome this, the large sensor sizes of Ultim Max ensure maximum counts are achieved under the most demanding conditions. Sensor sizes of 100 mm2 and 170 mm2 allows a consistent count rate to be achieved as you decrease electron landing energy from 5kV to 3.5 kV. 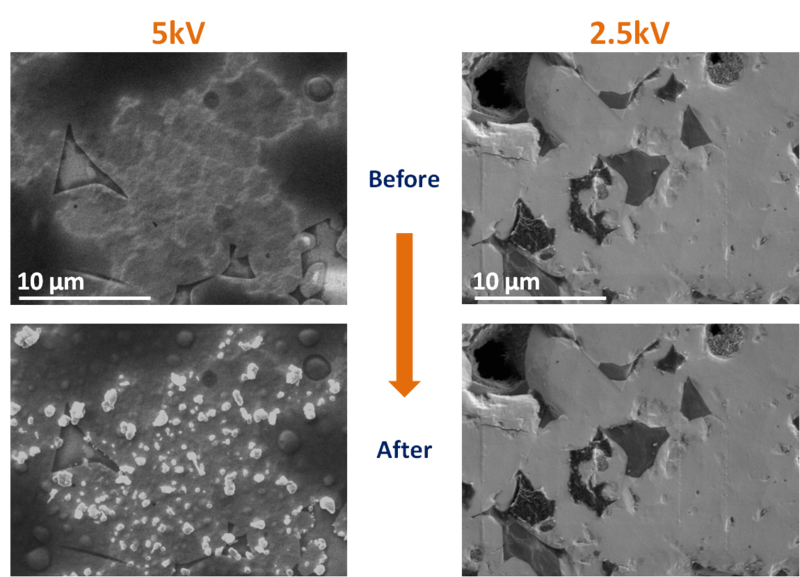 For the ultimate spatial resolution in bulk samples Ultim Extreme allows practical count rates to be achieved at electron energies of 1.5kV and lower. 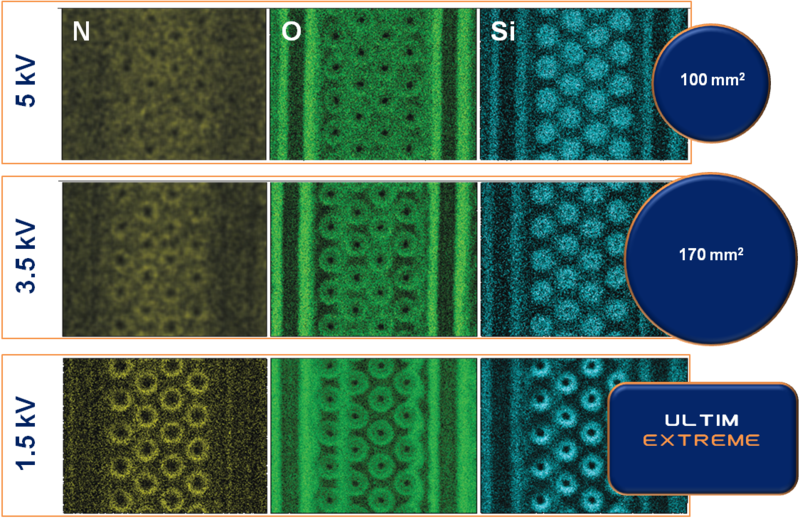 TruMaps of N, O and Si from a de-layered semiconductor device collected with constant acquisition time showing increasing spatial resolution with decreasing incident electron energy. Count rate is maintained at low kV by increasing solid angle, and using windowless collection in the case of Ultim Extreme. Request Pricing Got a question?